With his father, Sam Samardzija, a semi-professional hockey player, and his brother, Sam Samardzija Jr., an All State football and baseball player, former Hawk, Jeff Samardzija, had some pretty big shoes to fill. Samardzija grew up in Valparaiso, Indiana where he would become a letterman in not one but three sports, football, basketball and baseball. Samardzija started playing baseball at the ripe age of six when just about every American boy begins tee ball. 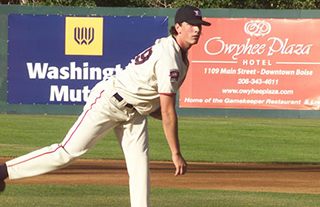 Eventually, “It becomes what you do.” While playing multiple sports in high school, Samardzija accepted an athletic scholarship to Notre Dame where he played football from 2003-2006 and baseball from 2004 to 2006. He was recognized as a Freshman All-American by Collegiate Baseball Magazine and continued to play at Notre Dame until he was drafted by the Chicago Cubs in the 5th round of the 2006 Major League Baseball Draft. Looking back over his years on the road to Wrigley, the best advice he has received is something we’ve all heard before, “Just go out and have fun and enjoy doing what you do.” For Samardzija the last two years have been pretty wild. “Where I was in 2010 to where I am now is a total 180.” He is just glad to see that his hard work has paid off! Do you have a most memorable moment in sports? What do you remember most about Boise?